Also, in the spirit of finishing stories, I'm going to intertwine this post with the follow-up to The Vivianne: The Monk Painting. If you are into oil paintings, monks, and old ladies hawking antiques this should be right up your alley. If not, there's not much I can do for you on this one. Not the best picture. The birds weren't finished until late so flash had to be employed. Back in Wilmington, NC with a few hours to kill and determined to right my previous wrong, I put on my best treasure hunting gear (Tommy Bahama shirt, stone-washed jeans, monocle) and went back to the antique warehouse from whence came The Vivianne. Collecting the stuff needed for the Cornish Hens with Figs and Bacon was easy. Few ingredients. Nothing too fancy. And everything could be picked up at our local farmers market. I don't know if you've ever spent any time in the huge antique warehouses of the south, but they're all the same - a cross between insane asylums and old-age homes masquerading as stores. Basically, you get a lot of really nice older ladies talking to you in non sequiturs. Seriously. Imagine your crazy aunt Gillian finding a tchotchke in her attic and trying to sell it to you for 30 bucks. This is essentially every conversation you'll have inside the antique warehouse. You end up doing a lot of smiling and head-tilting. By now I knew a few of these characters by name because I was regularly traveling to Wilmington to visit Amelia in grad school, and I always ended up at this place. Per my routine, I chatted up Marcie, smiled, agreed with everything she said, scratched my head and went to the back of warehouse #2 where I proceeded to rifle through the new estate paintings that had come in over the past couple weeks. The other thing that attracted me to this recipe was that it utilized bacon fat. I like that. You cook the bacon, then you cook the garlic in the pan with the bacon fat, but hang on to the pan because it's not over yet. Just wait. 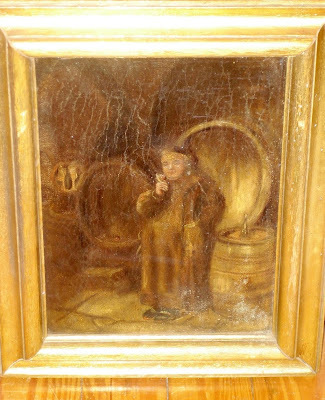 I found The Monk Painting hiding behind a 300 lb. mirror. The painting was old and covered in generations of dirt, but it was a cool and relatively inexpensive. When I brought it to Marcie she looked shocked. Apparently when so-and-so's estate was consigned to the place, three different people had been in looking for The Monk Painting. I snatched it up. Out came the cornies (cornish game hens). These suckers are SMALL (and bloody). Amelia wants her vegetarian readers to know that she had nothing to do with this, and that these birds were organic. When I got home, the research began. A rusted bracket on the canvas read "PAT Feb 13 1883 ADS." And a faded name and 5 digit phone number written lightly in pencil on the back of the frame pointed to its previous owner and the last framer. Bacon fat time. I cut the hens in half and cooked them skin-side down in the bacon fat for about 6 minutes. After that I threw the halves in the oven with the figs and thyme, but don't even think about discarding the bacon fat. Seriously. We're not done with it. So, I find out that the previous owner was a wealthy patron of the arts in North Carolina and that it was probably painted in 1883. But as these things go, after a month of on and off research, I had taken it as far as I could. I needed to send it my friend/notorious Vivianne-hater at Sotheby's. Here's where the recipe gave me problems. The second to last step has you putting the hens in the oven. It says, "preheat the oven to 500" and then "roast until hens are cooked through, about 15 minutes." Not true! I checked my hens after 15 minutes and they weren't close to be done. I kept them in for another 5 minutes. No dice. Another 10 minutes? Still not quite done. To be fair to the recipe, I didn't have the oven pan that it called for so I had used a lasagna pan, but could that really throw off the time that much? Not to mention, I halved the recipe - two hens instead of four. Why was it taking so long? I started pacing. Another 10 minutes. Still pink in the middle?! It was really strange, and all in all it took about 50 minutes in the oven at 500 degrees to cook the hens through. As promised, this was followed up by turning up the heat on the pan of bacon fat and squeezing half a lemon over it, making a sauce to drizzle over the hens with the bacon and garlic. The long and short of The Monk Painting goes like this: My friend came back with the diagnosis that it is an unattributed painting from the late 1800s in the style of Eduard Von Grutzner. According to my friend, at auction, the painting should fetch around 30 times what I paid for it. And despite her pleading, I won't let Amelia sell it. It's The Monk Painting! Below is a horrible picture with flash from when I first bought it. It's dirty, and you can't really see the color and detail, but the painting is currently in Pittsburgh so this is the only picture we've got at the moment. What's with the wry grin, Monk? Oh, and the hens were delicious and they somehow cooked through really well? Cook bacon in a 12-inch heavy skillet over medium-low heat until crisp. Transfer to paper towels to drain. Add garlic to skillet and cook, stirring, until golden, about 1 minute. Transfer to paper towels with bacon. Pat hens dry and season with 1 1/4 teaspoons salt and 3/4 teaspoon pepper. Heat fat in skillet over medium-high heat until it begins to smoke. Brown 4 hen halves, skin side down, about 6 minutes. Transfer, skin side up, to a large 4-sided sheet pan. Brown remaining hens, transferring to sheet pan. Reserve skillet. 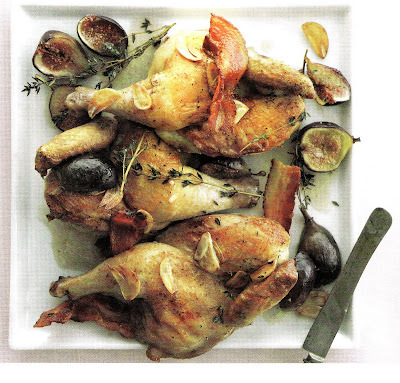 Scatter thyme and figs over hens, then roast until hens are cooked through, about 15 minutes. Meanwhile, deglaze skillet with lemon juice by simmering, stirring and scraping up brown bits, 30 seconds. Pour over roast hens. Scatter bacon and garlic over hens. ok, firstly, any friend/relative of kara is a friend of mine. thanks so much for checking out the blog! secondly, i can't believe we can't sell the monk painting. i'd sort of forgotten about it, what with it being in pittsburgh. but let's at least take it to the antique roadshow, matt! this looks amazing!! nice job. thanks, Kim! courtney is the best. Just found this recipe today and am making it for dinner this week. I was thinking about using bone in chicken instead of the hens. the pix taken w/ the Sony W5 of pre-baking looks.. surprisingly good! I know! It's been a great camera for us, but It's limitations are beginning to become an issue so we're thinking of upgrading to the CANON POWERSHOT G10 or the LUMIX DMC-LX3. Any preference or recommendations?